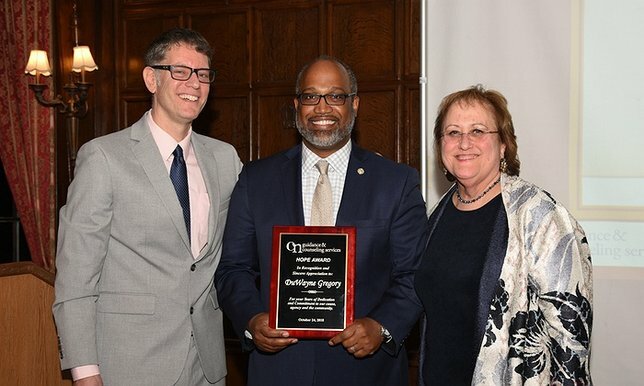 Suffolk County Legislature Presiding Officer DuWayne Gregory, center, accepts an award from CN Guidance & Counseling Services CEO Jeffrey Friedman, left, and Mary Silberstein, division director of integrated counseling and recovery services. Hauppauge, NY - October 31, 2018 - Suffolk County Legislature Presiding Officer DuWayne Gregory was honored by CN Guidance & Counseling Services at its annual Taste of Hope gala for his dedication to helping individuals and families affected by substance abuse and mental health issues, directly in line with the nonprofit’s mission. In April of this year, Presiding Officer Gregory secured funding for Project Connect, a collaboration between CN Guidance and Northwell Health to immediately provide resources and referrals to patients who land in the emergency room after an opioid overdose. If the patient is interested in accepting support from the program, CN Guidance outreach staff members develop an action plan for treatment and provide necessary referrals and appointments in collaboration with Northwell Health’s robust Screening, Brief Intervention and Referral to Treatment (SBIRT) protocols. Project Connect staff members continue outreach efforts even after the patient leaves the hospital. The program, which has been instituted at Southside and Huntington hospitals, has seen 58 patients with an engagement rate of about 50 percent, higher than the 10 percent national average of similar programs. The gala was held at the New York Institute of Technology’s de Seversky Mansion in Old Westbury on Oct. 24. The event included tastings from more than 30 area restaurants, breweries and celebrated chefs including Lisa-Ann Marchica Marchesi, who was on the show “MasterChef.” Dr. Sandeep Kapoor, director of Northwell’s SBIRT program, was also honored. Subject: LongIsland.com - Your Name sent you Article details of "Presiding Officer Gregory Honored for Efforts to Help Those Affected by Substance Abuse"